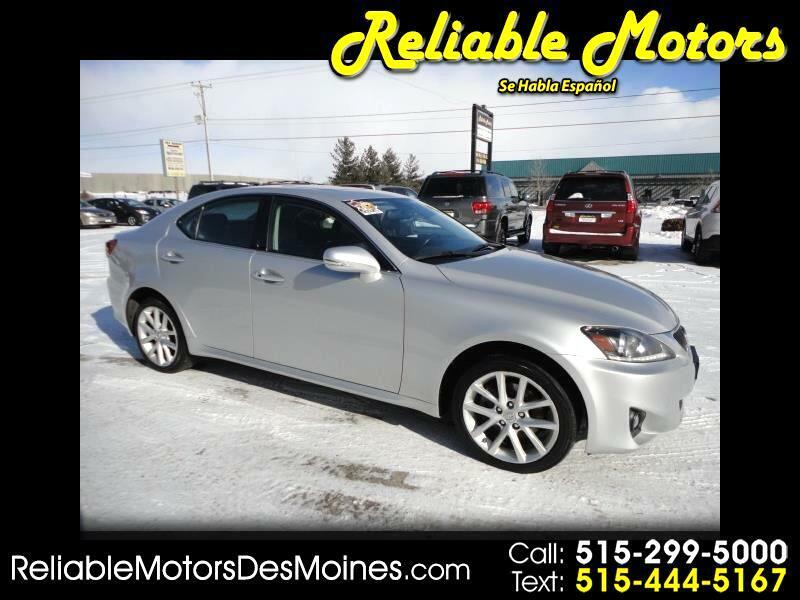 Add some driving pleasure to your routine with our 2012 Lexus IS 250 AWD. Under the hood sits a 2.5 Liter V6 that generates 204hp while connected to a smooth 6 Speed Automatic transmission. Prominently displayed here in gorgeous Atomic Metallic Silver, it offers near 27 mpg and comfortable, confident AWD handling. Refreshed for 2012, our IS 250 boasts a sculpted, athletic exterior with 17" wheels and fog lamps. The impeccable cabin has a polished feel that is achieved with heated and ventilated premium leather seats with memorized adjustments, luxury wood trim, a sunroof, and state-of-the-art technology with remote start. Sit back and enjoy the ride as you are guided by voice commanded navigation, and stay connected with Bluetooth technology while listening to an amazing 13 speaker sound system with satellite radio and an iPod/USB interface. The workmanship behind this car is evident in every detail, especially in the tranquility of the cabin that insulates you from distractions. Of course, Lexus is committed to safety with anti-lock disc brakes with brake assist, traction and stability control, and numerous airbags. It also includes a Safety Connect telematics service with Automatic collision notification, stolen-vehicle locator and an emergency assistance button that provides you invaluable peace of mind. You'll know you've made the right choice once you sit behind the wheel. Print this page and call us Now... We Know You Will Enjoy Your Test Drive Towards Ownership!